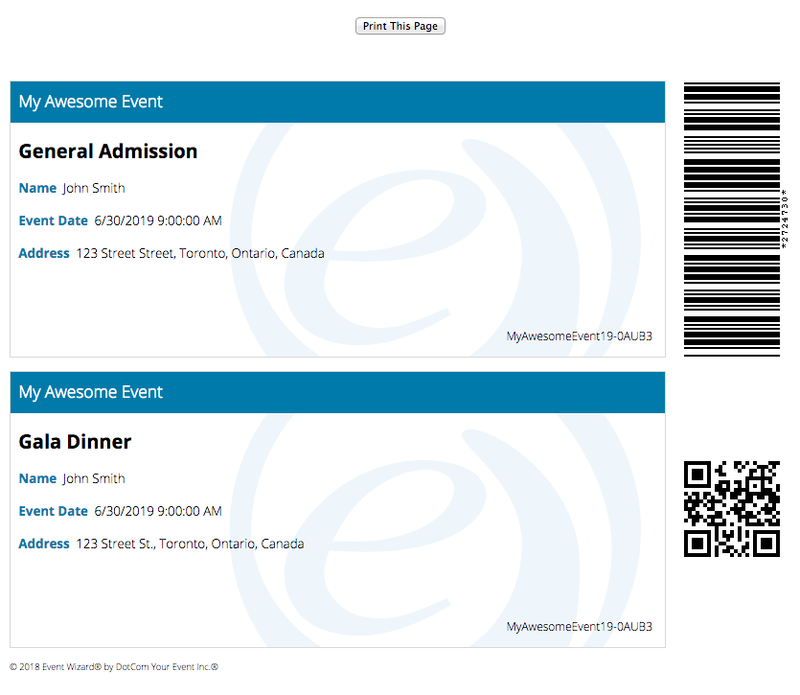 We’ve had tickets in Event Wizard® for some time now, which utilize barcode scanning for quick and accurate check-ins. This is great for something like a general entry ticket to a conference, but what if the conference has multiple seminars or other components? This is where fee-based tickets come into play. A fee-based ticket is exactly that: a unique ticket, (or multiple tickets for fee quantities) for each fee on your form. They are great for things like multi-seminar conferences, pre-ordering merchandise, or event tours. Since each ticket is fee-dependent, we will need to enable it for any fee that requires tickets. For this example we will be adding a new fee, for which we will enable tickets. In the Properties section of the Add a Fee page you’ll notice a few checkboxes, one of which reads “Enable tickets for this fee?” – check this box. NOTE: You can also enable tickets for any existing fee by editing the fee and ensuring that same box is checked, but try to avoid doing so once an event has already started taking registrations. If you do not enable fee tickets before the registrations start coming in, you will need to update each existing registration in order to generate tickets for those registrants’ fees. Once saved, we can test it out by completing a registration and viewing the Thank You/confirmation page. Under the event header, you’ll notice a red “View and Print Your Ticket” button – clicking this button will bring up the tickets page. Here is where you can view your tickets or print them out for later use. Assuming you have general tickets enabled for your event, you’ll see this ticket at the top with the title “General Admission”. Underneath, you’ll see all the tickets for fees which you have tickets enabled, including multiple unique tickets for multiple quantities. These work the same way as the general tickets, in that they can be scanned and recorded by our Attendee Scanner app. That’s it! Just be mindful of a couple key things mentioned above and you shouldn’t have any issues with fee-based tickets. However, if you do run into any roadblocks, you can always contact tech support through your account and we will get you sorted as soon as possible. Merge tags are a vital tool when composing your confirmation emails, since they allow you to personalize each registrant’s emails by automatically inserting things like their name and registration info. Our latest system merge tag generates a personalized link to each registrants’ ticket, for when it comes time to check them in at your event using our free mobile Attendee Scanner app. Adding a Ticket Link to your confirmation email is easy. Start by going to your event task list and clicking the Edit Payment Confirmation email link. Next, click the Insert System Merge Tag dropdown in the editor’s toolbar and scroll down – you’ll notice an option to insert the Ticket Link. 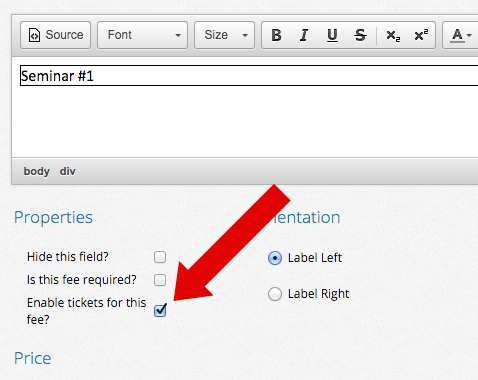 Once selected, the Ticket Link merge tag will be inserted next to your cursor in the editor. NOTE: It’s important to keep in mind that the ticket will only successfully scan once the registrant has paid for their registration, so it makes the most sense to place this tag in the Payment Confirmation Email, rather than the Registration Confirmation Email. Much like an <a> tag in HTML, the Ticket Link merge tag consists of an opening tag, link text/contents, and a closing tag. Please ensure the opening and closing tags aren’t altered, since they tell the system where to insert the custom link when the email is eventually sent out. The only part we need to be concerned with is the link text between the two tags – change it to something more relevant, similar to the screenshot above, then click Save. It’s important to test your confirmation email to ensure the link is appearing and functioning properly. Once you receive your test email, assuming everything went as planned, you’ll notice that the Ticket Link merge tag has been transformed into a proper link, which gives access to a personalized ticket for the registrant to whom it was sent. That’s it! Nice and easy. If you have any questions about the new Ticket Link merge tag or any other merge tags, give us a shout. Also, be sure to download our mobile Attendee Scanner app so you’re prepared for when it comes time to check in attendees at your event – it’s free! Sign up below for Event Wizard® tips & tricks in your inbox.